Maybe you heard the rumours - but you immedietly put them in the "I don't care" basket, along with the ages of your co-worker's nieces and nephews. Well I've got news for you - LoRaWAN is relevant! And it's cool! And it's HERE (nearly)! And I'm explaining it! Not all smart devices are smart ideas. Why do we need so much connectivity anyway? Those of us of a certain age know just how much life changed with the advent of the smart-phone. Thanks to more or less unlimited mobile access to the internet, we can check the weather report, look up bus timetables, and check in with friends on the other side of the world - all for free, all while we’re on-the-go. With the ever expanding ‘Internet of Things’ (IoT), this connectivity is increasing: objects (devices) are submitting their data to the internet, too. The usefulness of this data varies enormously - we’ve probably all read stories of ‘IoT fails’ (smart prayer beads, smart toasters, and smart water bottles to name a few) - but data can also be wisely collected, shared and analysed to save time, money and energy. Imagine driving into the city and knowing exactly where to find available parking. Imagine being able to monitor your diabetic child’s insulin levels just using an app on your phone. Imagine a manufacturing company pre-emptively saving thousands of hours of down-time by being able to accurately monitor their equipment. It’s hard to name a sector which wouldn’t benefit from an integrated and well-planned IoT: town-planning, agriculture, health, education, industry, logistics and environmental monitoring to name a few. Why can’t we rely on exisiting infrastructure to support a growing IoT? Anyone who has moved into a house without a waiting WiFi connection can describe just how much many of us have come to rely on our connectedness. Unfortunately however, WiFi has a limited range. Even in a large open space without any obstacles, the maximum range of the network is around 300m. Similarly, Bluetooth has a standard range of 10m - which isn’t very useful if we’re trying to send data across an entire city. The mobile internet used in our smart phones has a much wider range - but it requires a lot of power. We don’t want to have to be charging monitoring devices daily, like we do our phones -especially if sensors are stored in remote or difficult to access locations. Why is LoRa able to support a growing IoT? LoRa is a type of LPWAN - a low power wide area network. It uses low radio frequency bands to send and receive communications at a very low data rate, but across a very long range (up to 150km - but usually closer to 5km in the context of a built-up city). A LoRa network can be relatively cheaply and easily expanded, simply by bringing more gateways online. LoRa is unable to support voice calls, video or even image sharing - but it’s perfect for communicating sensor data, which is typically just a small collection of numbers (temperature, speed, density, etc). Its raw maximum data rate is 27kb/s (kilobit per second). Because of this tiny bandwidth, usage of LoRA only requires a small amount of energy - devices communicating on the network can last for up to 10 years on a single battery change. What’s the difference between LoRaWAN and LoRa? LoRa is the physical layer of communication - it’s the radio frequency signals used to transmit data. 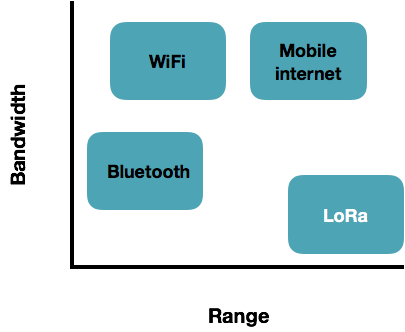 LoRaWAN describes the controls, protocols and systems which manage the usage of LoRa. Because all the millions of IoT devices which use LoRa won’t all be made by the same company, are there are limits to how much and what kinds of activity LoRa can support, the network needs to be standardised: hence LoRaWAN. Frequencies, data rates and power have to be regulated to allow fair use of the infrastructure. To prevent disruption of radio communications, there are strict regulations around which frequency bandwidths to use, which vary from country to country. In Australia, it’s 916.8MHz - 927.5MHz. Similarly, in order to prevent the airways from being overloaded, each device is only permitted to transmit a signal (or ‘be online’) for 1% of the time - if a transmission takes one second, the device must wait 99 seconds before sending another. How can I use LoRaWAN? There are two main ways to connect to LoRaWAN - via community or commercial means. There aren’t yet many locations in Australia with commercial LoRaWAN coverage that just anyone can tap into - but local governments are looking to change that, so it shouldn’t be long. We don’t know how much it will cost to access a commercially supported network - or indeed whether it will cost anything at all (hey, we can dream). Another option is to hop onto The Things Network and have a look at their map of gateways. The Things Network is supported by the community: anyone can connect their LoRaWAN gateway to expand it. If there’s a gateway near you, just sign up, sign in and connect. If not, you could buy your own (current retail price is around $800), or try building your own. Newer PostLoRaWAN: OTAA or ABP?